We at Technoprozium, wish you all a very happy and prosperous new year! 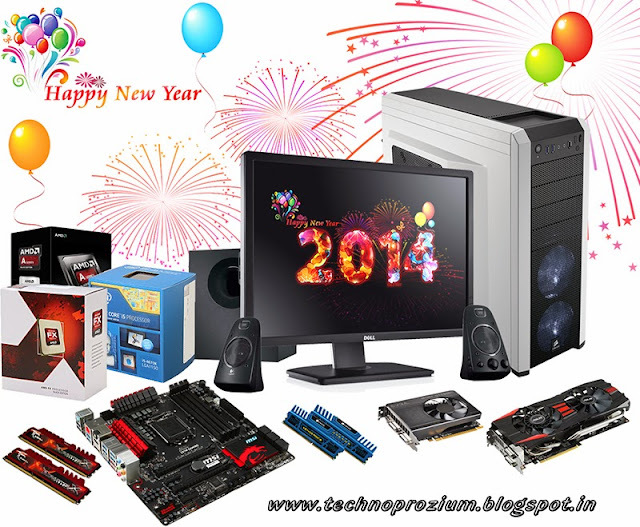 Time flies by at the speed of light with happy computing and as we say goodbye to 2013, we're very much confident that 2014 will bring the best yet! Here, we would like to take a moment to share our thoughts on a few things that we can expect this year. Last year was good and despite of the economical fluctuation, we witnessed some fine technologies and products from various major manufacturers. We have had new CPUs (Haswell, Richland) and GPUs (GK 110, Volcanic Islands/Hawaii) along with the much anticipated console updates from Microsoft and Sony. 2014 will give us a bigger picture of how well PC gaming does against the brand new X-Box One and PlayStation 4. Interestingly enough, PC gaming will unveil some secret weapons of its own this year in form of AMD "Mantle" and Nvidia "G-Sync" - so needless to say that we can't wait to see how things pan out! 2014 will kick-start with some of the biggest tech events including international CES (Consumer Electronics Show). These are events that not only showcases the latest and greatest of technology but also help us to get a better understanding of shifting trends. As always, Technoprozium will be there to bring you the most important and interesting bits. We're also expecting AMD's nexgen "Kaveri" APUs any day now. AMD is hoping to achieve a new level of integration with Kaveri and has much to prove with this new chip. As big fans of IGP performance it'll be very interesting for us to find out what kind of performance improvement AMD can bring to the table! Then as the year progresses we may find out what Intel has in mind for its 14nm manufacturing process (Broadwell anybody?)! However, Intel's upcoming Haswell-E based CPU could be the next big thing going forward into 2014, as there are reports of an affordable 8 core/16 thread HEDT processor. Ever since the Core 2 Quad (Kentsfield/Yorkfield) days, the number of processing core in a mainstream desktop CPU has been limited to 4, more or less. Right now only the higher-end and much expensive LGA-2011 CPUs come with six physical cores. So if Intel manages to deliver an 8c/16t part within a reasonable price-range that could take multitasking to a whole new level! Now lets move on to some other things. With Apple relentlessly pushing the pixel threshold of modern computing devices, it was a matter of time before others followed the suit (how typical of our industry!). 2013 marked the inception of big displays. A stunning IPS panel with ultra HD resolution might describe the wettest dream of an enthusiast but the nightmarish price keeps it beyond the reach of most mortals! Will 2014 be the year when these 4K wonders finally comes down to the range of affordability? We believe they will most certainly become cheaper as more vendors joins the bandwagon but we might have to wait little longer to see mass market adoption! Steam Box and Chromebook are also on our radars as promising devices. But a lot depends on what development path Valve and Google choose for these products respectively. Performance, price and convenience are the crucial factors here and this year it'll make for an intriguing observation whether or not these two can break it into the mainstream! The image is composed of some of the best hardware we confronted last year. Can you tell what parts are missing in order to complete a build?